It’s boy meets girl with many twists and possibilities in Nick Payne’s “Constellations,” presented by TheatreWorks Silicon Valley. With its focus on theoretical physics, this 2012 drama seems well suited to TheatreWorks audiences. The term “theoretical physics” might intimidate some people, but be assured that at its heart “Constellations” is a captivating romance between a beekeeper, Roland (Robert Gilbert), and a university professor, Marianne (Carie Kawa), in England. Their initial meeting at a barbecue repeats several times, each with a different twist. From there it progresses to other meetings, each with more twists. Scenes don’t necessarily follow chronological order, but they’re easy to follow. The play also posits different outcomes. For example, Marianne begins to experience physical problems that could be relatively harmless or fatal. 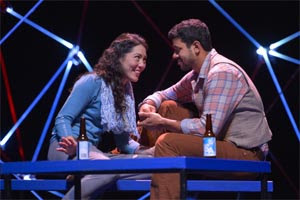 Under Kelley’s skillful direction, Gilbert as Roland and Kawa as Marianne both navigate the changes easily, allowing the audience to hope for a positive outcome for both characters. Production values are high with an intriguing set by Andrea Bechert with subtle lighting changes by Steven B. Mannshardt, complementary sound by composer Cliff Caruthers and costumes by Jill Bowers. 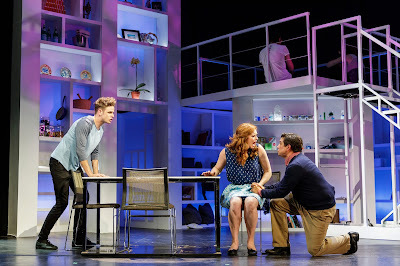 “Constellations” runs about 70 minutes without intermission. It will continue through Sept. 17 at the Mountain View Center for the Performing Arts, Castro and Mercy streets, Mountain View. For tickets and information, call (650) 463-1960 or visit www.theatreworks.org. Victor Hugo wrote “The Hunchback of Notre Dame” in 1831 and set it in Paris in 1482, but some of its issues resemble those troubling the United States today. These resemblances are seen in the musical version staged by Hillbarn Theatre to open its 77th season. There’s an autocratic church leader acting counter to Christianity’s teachings and his vow of chastity. There’s an oppressed minority group, gypsies, who are systematically excluded from the city. And there’s the bullying of someone who’s different. 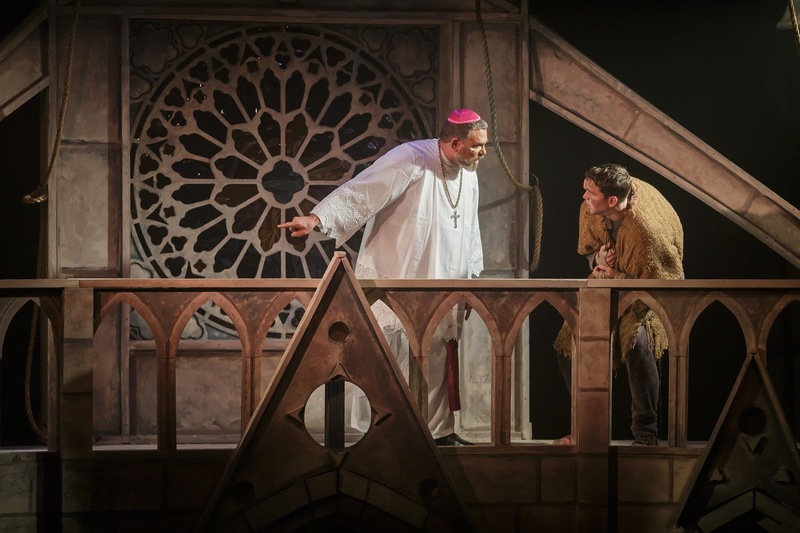 The church leader is Dom Claude Frollo (Gary Giurbino), archbishop of the Cathedral of Notre Dame. He has been entrusted with the care of his deformed infant nephew after the death of the boy’s parents. That boy grows up to be Quasimodo (Randy O’Hara), whom Frollo keeps as a virtual prisoner in the cathedral’s bell tower. One day Quasimodo escapes and encounters a group of gypsies dancing in the streets. He happily joins them until they start taunting him and throwing things at him. Only the gypsy dancer, Esmeralda (Amandina Altomare), takes pity on him. She becomes the love interest of Phoebus de Martin (Luke Hamilton), the soldier sent to find Quasimodo. She also catches Frollo’s lustful eye. Things don’t turn out well. This musical is based on the Disney film and uses its songs along with new ones by composer Alan Menken and lyricist Stephen Schwartz, with a book by Peter Parnell. Directed by Riley Costello with musical direction by Matt Bourne, Hillbarn’s production is a massive undertaking with six named characters, 11-member ensemble, 14-member orchestra and 18-member choir. 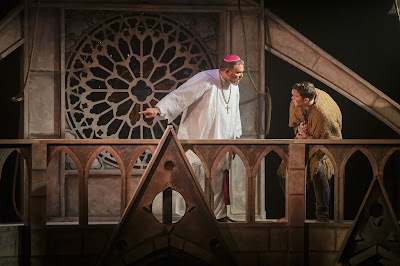 The action takes place on a two-level Gothic set created by Robert Bo Golden with lighting by Pamila Gray and costumes by Y. Sharon Peng, who all make positive contributions. However, the sound design by Alan Chang is uneven, resulting in the loss of some lyrics and lines. Choreography by Jeanne Batacan-Harper is fine. Choral director Joseph Murphy deserves recognition for the choir’s outstanding contributions. Performances by the principals are generally good, especially by Altomare as Esmeralda and Hamilton as Phoebus, who act and sing well. O’Hara’s acting as Quasimodo is good, but he sometimes sings too loud. Also noteworthy among the principals is Brian Palac as Clopin Trouillefou, the gypsy who serves as narrator. Although the production is uneven, on the whole it works well. Running more than two and a half hours with intermission, it will continue through Sept. 10 at Hillbarn Theatre, 1285 E. Hillsdale Blvd., Foster City. For tickets and information, call (650) 349-6411, Ext. 2, or visit www.hillbarntheatre.org. In “Airswimming,” presented by Dragon Theatre, playwright Charlotte Jones personalizes a dark chapter in Irish history. For some two centuries, ending in 1996, both sexes, but especially women, were institutionalized because they were marginalized for various reasons. Having a baby out of wedlock was a sure path to an institution. 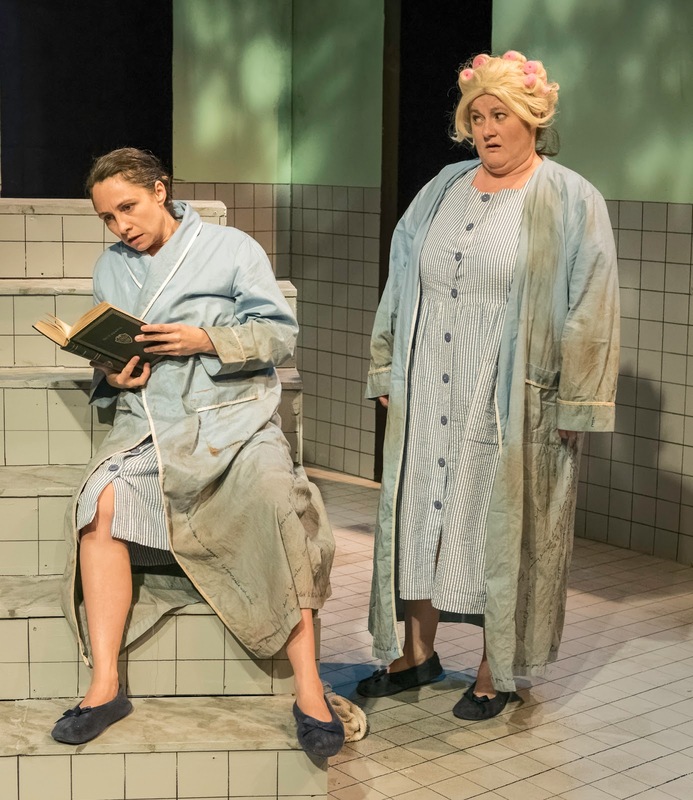 A two-woman play, “Airswimming” takes place in the fictional St. Dymphna’s Hospital for the Criminally Insane between 1924 and 1972. Dora, also called Dorph (Annamarie MacLeod), got there first. Persephone, also called Porph (Katie Anderson), arrived two years later. She says she was labeled a moral imbecile, but she insists she doesn’t belong there and will be released soon. The more seasoned Dorph knows better. Although their early encounters can be contentious, they develop a friendship and reveal more about themselves. The emotional Porph is a huge fan of Doris Day, often donning a blond wig and singing some of her signature songs. In more enlightened times, Dorph, who liked to smoke cigars, might have been a butch lesbian or maybe even a transsexual. Instead she expresses her admiration for the military and sometimes behaves as if she were an officer. As the years wear on, the two women take on different roles for each other. Dorph, who had been the strong one, becomes more despondent. Thus it’s Porph who becomes strong and encourages her friend not to give up. Well directed by Meredith Hagedorn, Dragon’s founder and artistic director, the two actresses both embody their characters convincingly. Each one is always in the moment. However interesting the play is, it has weaknesses, perhaps because it was Jones’ first play. The most obvious is that during most of its more than 100 minutes without intermission, there’s little sense of where it’s going, but it finally does come to some resolution. It then opens the door to wondering what happens next to these two women after so many years of mutual dependency. The starkly simple set is by R. Dutch Fritz with lighting by Patrick Mahoney, utilitarian costumes by Brooke Jennings and sound by Lance Huntley. “Airswimming,” which refers to a coping mechanism for the women, will continue through Aug. 27 at Dragon Theatre, 2120 Broadway St., Redwood City. For tickets and information, call (650) 493-2006, Ext. 2, or visit www.dragonproductions.net.